Facing the Atlantic Ocean and Vilamoura Yatch Marina, this cosy 4 star hotel offers 100 rooms, 55 suites including 4 Presidential Suites with a jaccuzzi on each balcony. An informal and familiar ambience is provided at the hotel, private gardens overlook the swimming pools. Guests can enjoy the hotel swimming pools including a jacuzzi and a separate children’s pool. The hotel also features an Italian restaurant , where guests can dine on the terrace and two bars. The Dom Pedro branch of hotels are experts at catering for golfing groups and are always a popular choice of golfbreaks.ie customers. 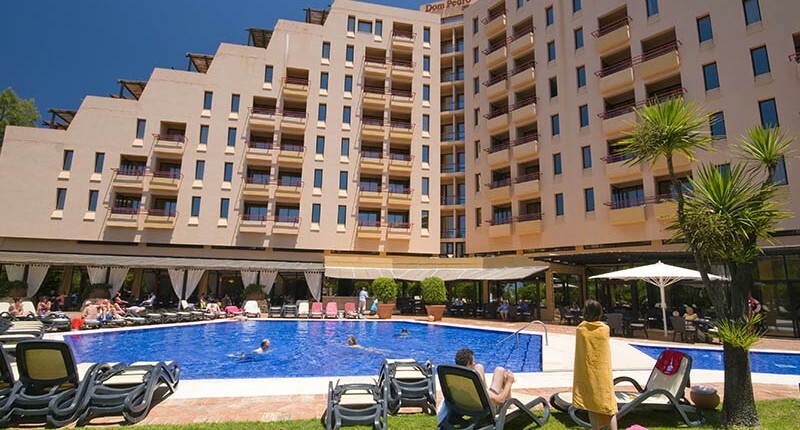 They offer quality 4* accommodation and always impress, the Dom Pedro Marina Hotel is in an excellent location beside the Vilamoura Marina and its many bars and restaurants, you will not be disappointed if you choose this hotel. Facing the Atlantic Ocean and Vilamoura Yatch Marina, this cosy 4 star hotel offers 100 rooms, 55 suites including 4 Presidential Suites with a jaccuzzi on each balcony. An informal and familiar ambience is provided at the hotel, private gardens overlook the swimming pools. Guests can enjoy the hotel swimming pools including a jacuzzi and a separate children’s pool. The hotel also features an Italian restaurant , where guests can dine on the terrace and two bars. A beach bar and sunloungers area, dedicated exclusively to Dom Pedro guests, is also available seasonally at the Vilamoura beach.